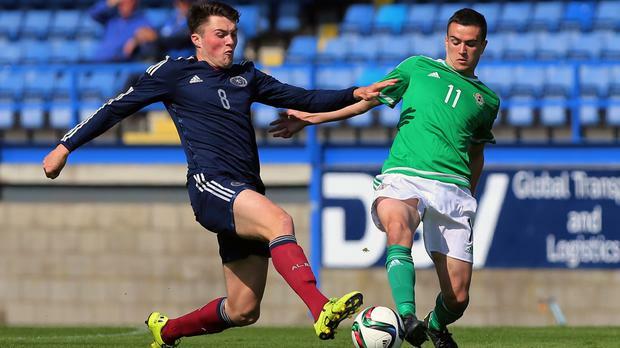 Northern Ireland got their first point on the board in qualifying for the European Under-21 Championship with a 1-1 draw in Iceland. But the visitors got off to a dream start when Stevenage defender Ryan Johnson headed home a Darren McKnight corner after just two minutes. McKnight and Ryan McLaughlin were then denied by saves from Iceland goalkeeper Frederik Schram before Michael Duffy fired a good chance off target. But Northern Ireland were pegged back seven minutes before half-time when Aron Elis Thrandarson latched onto a woeful backpass from Lewis Maloney and finished past Kilmarnock goalkeeper Conor Brennan. In the second half Mikhail Kennedy was denied by another fine save by Schram, although the Irish were indebted to a bad miss from Elias Mar Omarsson to ensure they came away with a point.